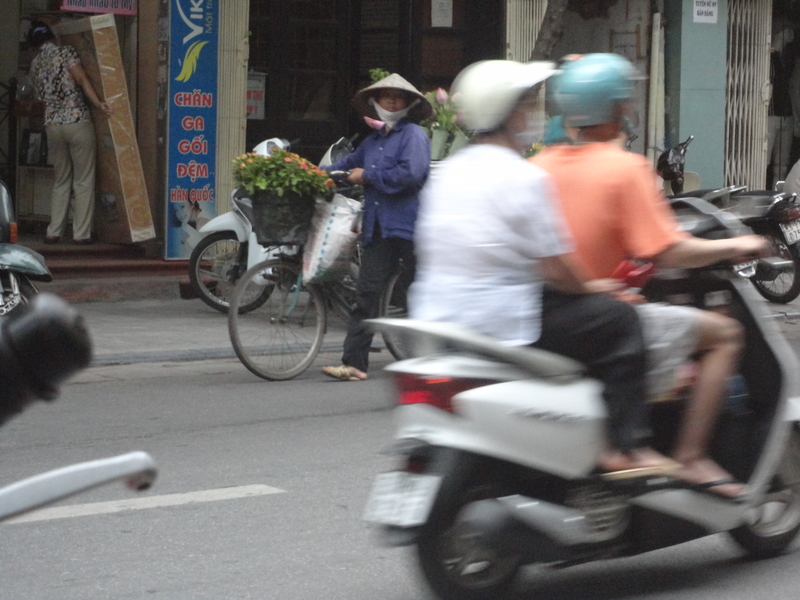 Side-Saddle Saigon – These Two Eyes! Mayhem. Absolute mayhem. This seems to be the only appropriate term to describe Saigon traffic. Stepping out of the airport to greet my driver to take me to my hotel in the Pham Ngu Lao backpacker area I immediately feel the rush of unbearable heat. Whew, this is going to take some getting used to. 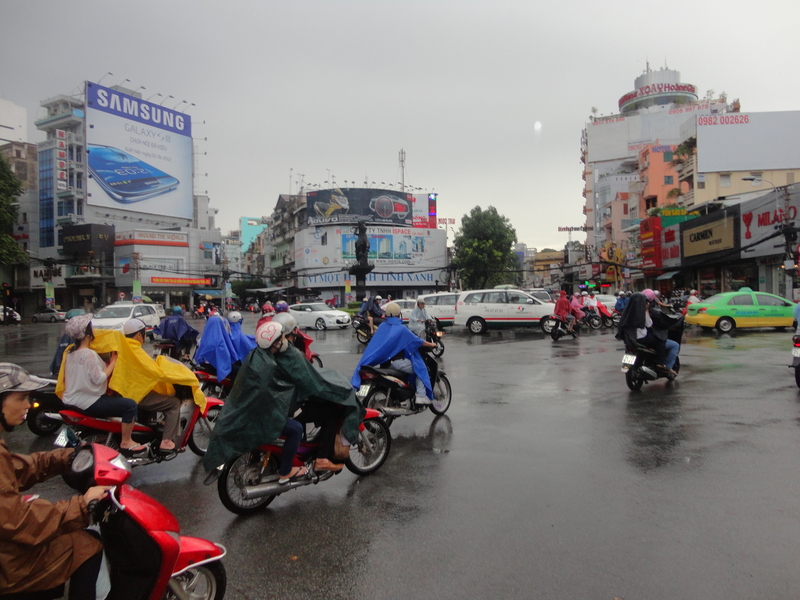 I jump into the back seat of a luxury sedan and take in my first encounter with Saigon, or the metropolis that is more commonly referred to these days as Ho Chi Minh City. There’s hundreds, thousands even. I’m not even sure how to count all of the motorbikes, scooters, and push bikes. The rev of engines, headlights flashing to get past, two quick beeps, one long honk. There seems to be a method to all this madness but to the untrained eye, mayhem I tell you, pure mayhem. Our car travels on as the traffic gets more and more dense. Next to me I watch a family calmly wait for a light to change. They are so close to my car that I can see the sweat on their foreheads. A small child is in the front, standing on the piece of plastic between the front wheel and the seat. The father is driving as the pregnant mother sits behind him with an infant squished in between the two. All seems calm and normal. These children grow up on motorbikes no different than a westerner in a car seat fastened safely in the back of a minivan. The variety of bikes is vast, from knock off Gucci labeling to beat up motorbikes with missing mirrors. Many wear hospital masks covering their faces, even ones with cutesy designs to protect themselves from the thick smog. Traveling on motorbike or scooter (the cheaper of the two) is the most economical, and popular of ways to travel around. I see men in suits commuting carrying briefcases, women in high heels, other travelers without shirts even. But the true testament to the means of transport is witnessing a motorbike with chicken coups fastened to each wheel, or multiple vases with arrangements of fresh flowers. I’ve seen huge pieces of timber being balanced on one’s head, and full meals being consumed while texting at the same time. Riding side saddle, hands free – no problem. It’s a way of life for all. But as an outsider stepping into the world it seems hectic and overwhelming. When the light turns red the masses stop at the break, well, some of them. The scooters inch nearer and nearer as if it were a starting line, each wedging their bike closer to the finish. I sit in the back seat and wonder, what’s going to happen when the light turns green? Who’s going to win because there is not enough road space for everyone to make it on the first go? Oh, how naïve I am so early into my adventure. 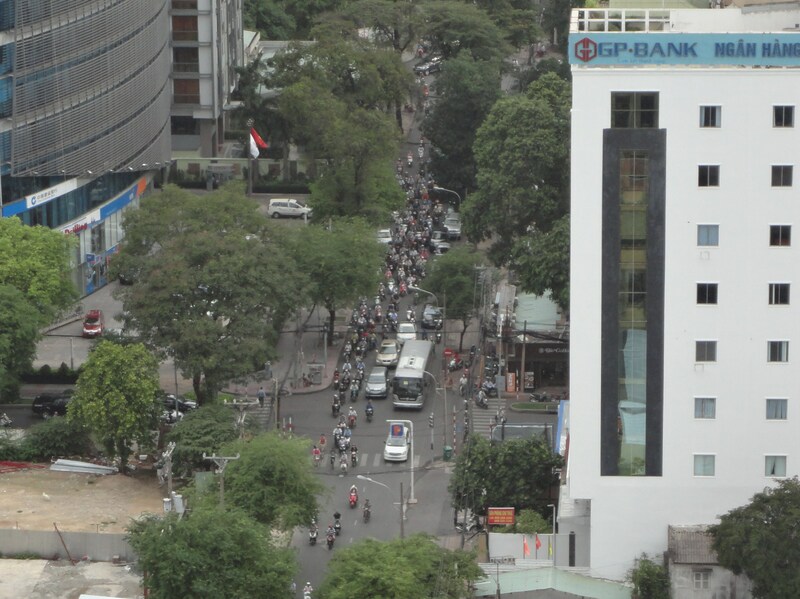 The biggest challenge after witnessing the chaos on the roads came when it actually became time for us to cross the street. There was a lot of hesitation. And a lot of fear. But we were offered some good advice, just go and keep a steady pace. They will judge your speed, and go around you. Thank you for sharing that secret law. Without, we would have never been able to leave a one block radius. The “dry humid” heat? You’ll have to explain that one to me.